Roads in Ranchi are full of small Nexa hatchback cars. Small Nexa cars in Ranchi are the real flapjacks, when it comes to car sales in Ranchi. Let’s put it under the magnifier. What makes people buy Nexa cars in Ranchi and makes Nexa a mass-vehicle choice? Is it the comprehensive features or the affordability that make small Nexa hatchback cars such high on demand? Research says that during the last FY a total number of 10,000+ Nexa cars have been sold from the leading Maruti Suzuki Nexa Showrooms in Ranchi. People by and large choose to buy Nexa cars in Ranchi and that’s why it’s selling like a hot cake. With the changing time and market demand the small car segment has evolved aggressively. It’s evident that customers want to buy Nexa cars in Ranchi, because they want spacious, fuel—efficient, feature-loaded and premium looks all-in-one. Ignis – Maruti Suzuki Ignis is one favourite hatchback of the millennial. This budget-friendly small car has an attractive, radical exterior profile. An enjoyable driving experience is another fact behind its massive popularity. Ignis comes in 1.2 litre petrol and a 1.3 litre Diesel that come mated to a 5-speed manual transmission. As it comes with Maruti’s lightweight HEARTECT platform, thus it also has the same engine and power generation features as the Swift has. Baleno – When it comes to the best looking hatchback cars in current market, none can beat the looks of Maruti Baleno. 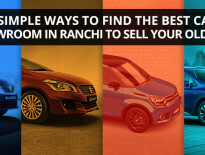 Additionally, Baleno on road price in Ranchi is quite rational than that of the other major cities in India. Having categorized in the premium segment, Baleno took the market by storm with the first look launch. Baleno is the best featured small hatchback from Nexa and it has all that Maruti can offer the best. People in Ranchi simply don’t mind to wait longer post-booking. As the market demand is on the higher side, all the leading Maruti Suzuki Nexa Showrooms in Ranchi are currently over loaded with the booking requirement. Hurry! Make one of these top-sellers yours. Click here for booking a test drive. Book a car online now!